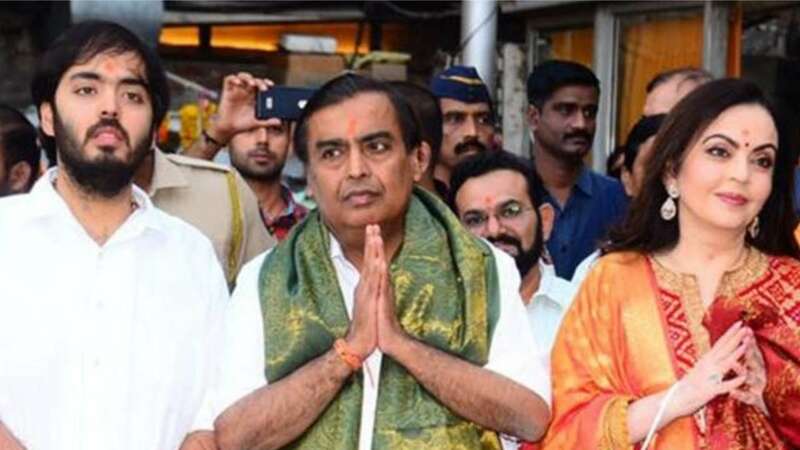 Feb 11 (AZINS) Business tycoon Mukesh Ambani was seen along with his wife Nita Ambani and son Anant Ambani visiting Mumbai's Siddhivinayak temple today to offer prayers and give the first wedding Invitation card of Akash Ambani and Shloka Mehta. Shloka Mehta is the youngest of three children of diamantaire Russell Mehta and his wife Mona Mehta. Mukesh and his younger son Anant were spotted outside the temple, wearing half-sleeved white shirt and black pants. They were accompanied by Nita, dressed in a red and golden kutra coupled with matching Palazzo pants. Akash proposed to Shloka couple of months ago at a private ceremony in Goa that was attended by both the families. The two even performed together at his sister Isha Ambani's sangeet ceremony last year. According to the reports, Akash and Shloka's wedding is going to take place in second week of March. The Ambanis ended 2018 on a high note with the wedding of their daughter Isha to Anand Piramal, son of Ajay and Swati Piramal. The new year will now see the wedding of their eldest son to his childhood sweetheart Shloka.